To the Editor — Early climate forecasts are often claimed to have overestimated recent warming. However, their evaluation is challenging for two reasons. First, only a small number of independent forecasts have been made. And second, an independent test of a forecast of the decadal response to external climate forcing requires observations taken over at least one and a half decades from the last observations used to make the forecast, because internally generated climate fluctuations can persist for several years. Here we assess one of the first probabilistic climate forecasts with a full uncertainty assessment2 that was based on climate models and data up to 1996. Using observations of global temperature over the ensuing 16 years, we find that the original forecast is performing significantly better than a hypothetical alternative based on the assumption that decade-to decade temperature fluctuations consist of a random walk, that is, a sequence of random fluctuations with no externally driven warming trend. The original climate forecast also outperforms a very simple interpretation of the climate models used for the latest Assessment of the Intergovernmental Panel on Climate Change (IPCC), supporting the conclusions of previous assessments that the spread of such an ensemble is not, on its own, an adequate measure of forecast uncertainty. An evaluation of early predictions of the IPCC noted that although these predictions provide support for the contention that climate is responding to enhanced greenhouse gas levels in accordance with historical expectations, formal evaluation is difficult because these early forecasts were framed as responses to idealized, CO2-only scenarios and were not couched in unambiguous probabilistic terms. A climate forecast can only be evaluated and potentially falsified if it provides a quantitative range of uncertainty. For example, if, at verification time, observations lie outside the 5–95% forecast uncertainty range, a forecast can be said to have been falsified at the 10% level. This could indicate an error in initial conditions, forcing or response, or it could occur simply by chance. Hence forecasters must be clear what it is they are forecasting (including uncertainties), and at the same time, evaluators must focus on what has actually been forecast. For example, the disagreement (if any) between recent model simulations and observed climate evolution within the period 1998–2012 would be more significant if the scientific community had previously claimed that these models provided a complete forecast of uncertainty in the distribution of trends over this period — which it did not. One of the first climate forecasts to provide a formal estimate of the range of uncertainty was a prediction of global mean surface temperature made in 1999 using simulations with the HadCM2. Figure 1 | Evaluation of decadal climate forecasts (updated from Fig. 3 of ref.2). a, Global temperatures relative to the pre-industrial era under a version of the IS92a scenario of relatively high greenhouse gas and anthropogenic sulphate forcing. The solid line shows the original ensemble mean. The grey shaded region indicates the 5–95% uncertainty interval in forecast anthropogenic warming after scaling the model-simulated spatiotemporal patterns of response to greenhouse gas and sulphate forcing to give the best ft (dashed line) to observations over 1946–1996. Large diamonds are decadal means of the observations: open black, used in calibration; solid red, frst- and last-available out-of-sample forecast decades. Vertical bars on the black and red diamonds show 5–95% ranges on decadal mean temperatures to be expected from internal variability as simulated by the HadCM2 model, which is also used for uncertainty estimates. It is consistent with more recent models and with residuals of the fit. The red line is a running decadal mean through the updated observations. Yellow diamonds are annual temperatures for the forecast period. b, Forecast warming re-expressed relative to 1986–1996, using the original software and constraints. Dotted lines indicate further uncertainty in decadal mean temperatures arising from internal variability estimated from the HadCM2 control, added in quadrature. Observed temperatures are shown relative to 1986–1996, omitting the 18 months following the Pinatubo eruption to avoid confusing anthropogenic warming with the recovery from that eruption. Thin and thick bars show 5–95% and 17–83% forecast ranges, respectively, from an unforced random walk model (green) calibrated with decade-to-decade temperature differences over the observed record until 1996 and from interpreting 120 CMIP5 ‘historical’ simulations as a simple, un-weighted ensemble, also omitting 1992 because of Pinatubo (blue). c, Probabilistic forecasts for the decade 2001–2010, relative to 1986–1996, from ref.2 (black), CMIP5 (blue) and random walk (green). All forecasts represented as Gaussians, with the CMIP5 ensemble histogram also shown. The red vertical line shows verification and the dotted vertical lines show the 5th and 95th forecast percentiles. Click for larger version. Which forecast is considered by the sceptics to have been falsified by the stasis for “the last 18 years (hadCRUt4), 19 years (hadCRUt3) or 23 years (RSS satellite dataset)” as Lord Monckton put it in his presentations in Auckland last week? Is it the same forecast the Allen, et al. paper compares with observations? Is it correct to say a stasis in temperature rise is consistent with that model forecast? Evaluation of decadal climate forecasts (updated from Fig. 3 of ref.2). Is that the forecast in this comparison? Or is this paper hopelessly off the mark and (crucially) precisely why? Abstract says the period is “1998–2012”. Therefore their running decadal mean is centred (science and engineering normal) because the red line ends prior to 2010. Cooling since December 2010 and the SMA is diverging radically away from the steeply rising “original ensemble mean” (solid black line) and the “best fit” after “scaling” (dashed line) trajectories, the same problem is evident from 1950 – 1970. This time however (2011 onwards) there wont be a repeat of the resumed warming from 1970 because there’s no longer a solar forcing to drive temperatures higher now that the sun is going into recession for 30 – 40 years. Basically, the models are not replicating the ~60-year periodicity in global temperature and they certainly wont replicate the ~200-year periodicity either given the models are parameterized with the peak solar level of the last 400 years (as of early 2000s – Lean recommendation) out to 2100. It would only be the observations that were updated with the latest data surely. The Letter however, refers to “One of the first climate forecasts to provide a formal estimate of the range of uncertainty was a prediction of global mean surface temperature made in 1999 using simulations with the HadCM2” therefore the “update” must be model forecasts for 2012/14 CMIP5/AR5 as well as the observations (this then in my previous comment is incorrect – “It would only be the observations that were updated with the latest data surely”). The model “update” seems to be the CMIP5 ensemble going by Figure 1 and for “IS92a scenario of relatively high greenhouse gas and anthropogenic sulphate forcing”. John Christy’s comparison is with RCP45, whether that’s the same scenario as IS92a I don’t know. 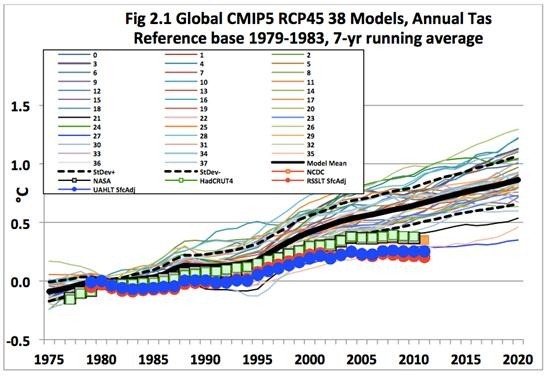 Given Ref.2 is a 2000 paper documenting (I assume) “a prediction of global mean surface temperature made in 1999 using simulations with the HadCM2” and CMIP5 is a 2012 ensemble, the 1999 forecast is not the same as the 2012 CMIP5 “update” forecasts but those latest 2012 forecasts are the same as in the Allen, et al. Figure 1. Not if the model ensemble mean doesn’t replicate cyclicity (both 60 and 200 yr) it isn’t, There are 2 or 3 individual CMIP5 models that actually mimiced the 21st century hiatus though (see Christy graph) so they are the only ones worth consideration anyway, as Judith Curry among many others point out (including me but who am I?). The last red dot (observations) is at 2008 on Fig 1,b (the 1999 forecast), so another 4 yrs of data (10 yr SMA) would be on the way out of the grey shaded region indicating the 5–95% uncertainty interval. The last red dot (observations) is early 2008 on Fig 1,a (the 2012 forecast), so another 5 yrs of data (10 yr SMA instead of centred mean) would be on the way out of the grey shaded region indicating the 5–95% uncertainty interval. That trajectory is consistent with their own falsification. The difference between the 1999 forecast (b) and the 2012 forecast (a) being that the latest observations (SMA) are at the edge of the (b) grey area but still well within the (a) grey area. 1) the (b) forecast begins at 1990 and the (a) forecast begins at 1950. 2) the 95% grey uncertainty area in (a) is MUCH wider than (b). At 2013 the (a) range is about 0.6K but only about 0.25K in (b). Both (a) and Mail on Line graphs begin at 1950 and both are from CMIP5 but the relatively unsmoothed observations in the Mail on Line graph are at the edge of the 95% uncertainty bound and therefore the prediction can be said to have been falsified at the 10% level once that bound is crossed. I’m inclined to think the Letter ‘Test of a decadal climate forecast’, by Myles R. Allen, John F.B. Mitchell and Peter A. Stott, is just an unscrupulous attempt to counter the David Rose, Mail on Line article and graph, by use of some highly misleading information presentation. More to learn about the solar driver apparently. The temperature hiatus is not the only atmospheric phenomena that is “puzzling” scientists right now apparently. They might ponder the de Vries cycle in both cases though. When scientists understand all of the ways that the Sun and Earth interact, we will know a lot more about the Earth and our place in the universe than we do today. Huh, “extreme weather”. How ’bout that? Some time ago, Tim C [Tim Channon] ran the Steinhilber TSI reconstruction through his amazing cycles analysis software and produced this curve. This analysis matches what is being said by Steinhilber in the above papers. A strong modulation at the length of the De Vries cycle (207 years) and another at around the millennial timescale (974 years) which matches Semi’s calculation of the cycle of angular momentum exchange in the solar system. Not a new discovery though as Scafetta points out in comments. This chart compares the development of Solar Cycle 24 with the last de Vries cycle event – the Dalton Minimum [about 1790 to 1830]. The Solar Cycle 24 ramp up in terms of sunspot number is tracking much the same as that of Solar Cycle 5 but about a year ahead of it. In the Talkshop post thread there’s a remarkable exchange between Tallbloke and Scafetta re peer-review of a Scafetta paper in which Svalgaard was involved as a reviewer. Long-term climatic changes related to solar forcing were examined using millennium-scale palaeoclimatic reconstructions from the Central Asian mountain region, i.e. summer temperature records for the Tien Shan mountains and precipitation records for the Tibetan Plateau. The reconstructions were based on juniper tree-ring width records, i.e. Juniperus turkestanica for the Tien Shan and Sabina przewalskii for the Tibetan Plateau. The data were processed using spectral and wavelet analysis and filtered in the frequency range related to major solar activity periodicities. The results obtained for various tree-ring chronologies indicate palaeoclimatic oscillations in the range of the de Vries (∼210-year) solar cycles through the last millennium. 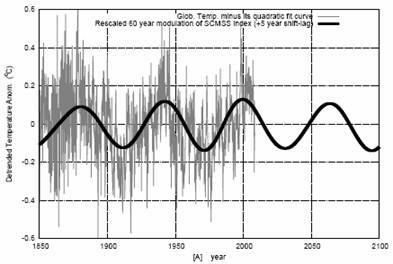 The quasi-200-year variations revealed in the palaeoclimatic reconstructions correlate well (R2=0.58–0.94) with solar activity variations (Δ14C variations). The quasi-200-year climatic variations have also been detected in climate-linked processes in Asia, Europe, North and South America, Australia, and the Arctic and Antarctica. The results obtained point to a pronounced influence of solar activity on global climatic processes. Analysis has shown that climate response to the long-term global solar forcing has a regional character. An appreciable delay in the climate response to the solar signal can occur (up to 150 years). In addition, the sign of the climate response can differ from the solar signal sign. The climate response to long-term solar activity variations (from 10s to 1000s years) manifests itself in different climatic parameters, such as temperature, precipitation and atmospheric and oceanic circulation. The climate response to the de Vries cycle has been found to occur not only during the last millennia but also in earlier epochs, up to hundreds of millions years ago. 1Met Office Hadley Centre, Exeter, UK. 2Department of Meteorology, University of Reading, Reading, UK. During the 20th century, solar activity increased in magnitude to a so-called grand maximum. It is probable that this high level of solar activity is at or near its end. It is of great interest whether any future reduction in solar activity could have a significant impact on climate that could partially offset the projected anthropogenic warming. Observations and reconstructions of solar activity over the last 9000 years are used as a constraint on possible future variations to produce probability distributions of total solar irradiance over the next 100 years. Using this information, with a simple climate model, we present results of the potential implications for future projections of climate on decadal to multidecadal timescales. Using one of the most recent reconstructions of historic total solar irradiance, the likely reduction in the warming by 2100 is found to be between 0.06 and 0.1 K, a very small fraction of the projected anthropogenic warming. However, if past total solar irradiance variations are larger and climate models substantially underestimate the response to solar variations, then there is a potential for a reduction in solar activity to mitigate a small proportion of the future warming, a scenario we cannot totally rule out. While the Sun is not expected to provide substantial delays in the time to reach critical temperature thresholds, any small delays it might provide are likely to be greater for lower anthropogenic emissions scenarios than for higher-emissions scenarios. From the 2010 Anniversary Series: a collection of reviews celebrating the Royal Society’s 350th Anniversary. Solar outputs during the current solar minimum are setting record low values for the space age. Evidence is here reviewed that this is part of a decline in solar activity from a grand solar maximum and that the Sun has returned to a state that last prevailed in 1924. Recent research into what this means, and does not mean, for climate change is reviewed. 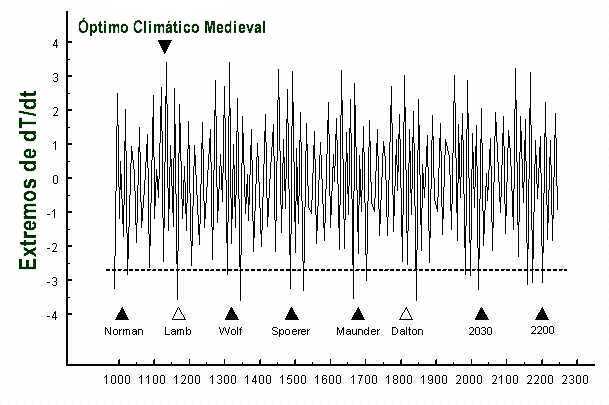 fourthly, a climate regime similar to 487 years ago (Maunder Minimum, 1600 – 1700) by 2500. Note too, that in Jones, Lockwood and Stott Figure 1 (page 3), the TSI forcing is significantly less than TSI change from MM to present after application of the forcing factors for use in the model simulations. The temperature result being that Jones, Lockwood and Stott's GHG-forced scenario returns just that a "likely reduction in the warming by 2100 is found to be between 0.06 and 0.1 K". The Maunder Minimum prediction of Abdussamatov is about 1.3 K reduction by 2058 and the Dalton Minimum prediction of De Jager and Duhau would be somewhere between the two extremes. The important point being that the IPCC's cited GHG-forced model-based solar scenario of only 0.06 to 0.1 K less warming by 2100 from Jones, Lockwood and Stott will be immediately invalidated if temperature levels fall below current levels by more than that amount over even the next 1 or 2 years all other factors remaining constant i.e. ENSO-neutral conditions, no major volcanic eruptions etc. They have no leeway whatsoever. Even their "However" caveat wont save them in that case either. Wow Richard C has massively hijacked this thread, which is a pity because I thought the original point raised was worthy of discussion. Can Richard C’s various meanderings be moved to somewhere more appropriate? It is not particularly clear what he is even going on about. Blog post: April 12. Nick says: April 17. Only 5 days late Nick, where have you been? Let me help you comprehend Nick. Both of the above sub-thread “meanderings” (in the absence of any other contributors except Andy) address either the post questions specifically or generally so this comment thread seems most appropriate to me Nick. Where else do you suggest moving the comments to that would be “more appropriate”? Abstract. Global climate models suggest that Antarctic snowfall should increase in a warming climate and mitigate rises in the sea level. Several processes affect surface mass balance (SMB), introducing large uncertainties in past, present and future ice sheet mass balance. To provide an extended perspective on the past SMB of Antarctica, we used 67 firn/ice core records to reconstruct the temporal variability in the SMB over the past 800 yr and, in greater detail, over the last 200 yr.
Our SMB reconstructions indicate that the SMB changes over most of Antarctica are statistically negligible and that the current SMB is not exceptionally high compared to the last 800 yr. High-accumulation periods have occurred in the past, specifically during the 1370s and 1610s. However, a clear increase in accumulation of more than 10% has occurred in high SMB coastal regions and over the highest part of the East Antarctic ice divide since the 1960s. To explain the differences in behaviour between the coastal/ice divide sites and the rest of Antarctica, we suggest that a higher frequency of blocking anticyclones increases the precipitation at coastal sites, leading to the advection of moist air in the highest areas, whereas blowing snow and/or erosion have significant negative impacts on the SMB at windy sites. Eight hundred years of stacked records of the SMB mimic the total solar irradiance during the 13th and 18th centuries. The link between those two variables is probably indirect and linked to a teleconnection in atmospheric circulation that forces complex feedback between the tropical Pacific and Antarctica via the generation and propagation of a large-scale atmospheric wave train. Abstract. In the present work the Arctic sea ice in the mid-Holocene and the pre-industrial climates are analysed and compared on the basis of climate-model results from the Paleoclimate Modelling Intercomparison Project phase 2 (PMIP2) and phase 3 (PMIP3). The PMIP3 models generally simulate smaller and thinner sea-ice extents than the PMIP2 models both for the pre-industrial and the mid-Holocene climate. Further, the PMIP2 and PMIP3 models all simulate a smaller and thinner Arctic summer sea-ice cover in the mid-Holocene than in the pre-industrial control climate. The PMIP3 models also simulate thinner winter sea ice than the PMIP2 models. The winter sea-ice extent response, i.e. the difference between the mid-Holocene and the pre-industrial climate, varies among both PMIP2 and PMIP3 models. Approximately one half of the models simulate a decrease in winter sea-ice extent and one half simulates an increase. The model-mean summer sea-ice extent is 11 % (21 %) smaller in the mid-Holocene than in the pre-industrial climate simulations in the PMIP2 (PMIP3). In accordance with the simple model of Thorndike (1992), the sea-ice thickness response to the insolation change from the pre-industrial to the mid-Holocene is stronger in models with thicker ice in the pre-industrial climate simulation. Further, the analyses show that climate models for which the Arctic sea-ice responses to increasing atmospheric CO2concentrations are similar may simulate rather different sea-ice responses to the change in solar forcing between the mid-Holocene and the pre-industrial. For two specific models, which are analysed in detail, this difference is found to be associated with differences in the simulated cloud fractions in the summer Arctic; in the model with a larger cloud fraction the effect of insolation change is muted. A sub-set of the mid-Holocene simulations in the PMIP ensemble exhibit open water off the north-eastern coast of Greenland in summer, which can provide a fetch for surface waves. This is in broad agreement with recent analyses of sea-ice proxies, indicating that beach-ridges formed on the north-eastern coast of Greenland during the early- to mid-Holocene. 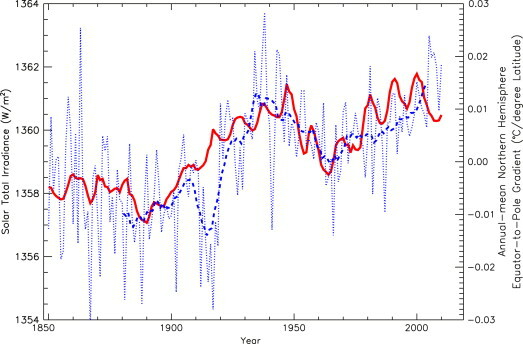 Figure 4 from Steinhilber and Beer shows solar activity peaked at the end of the 20th century, but is predicted to decline to levels similar to the Dalton Minimum during the 21st century. The two different shades of gray correspond to two different models. The Dalton Minimum “D” and Maunder Minimum “M” are notated. However, as shown by the graph below, the current solar cycle [SC 24, red] is already closely tracking the first solar cycle [SC 5, pink] of the Dalton Minimum, and both are quite weak in comparison to the average of solar cycles 1 through 23 [blue]. The implication in terms of climate regime by 2050 – 2100 (neglecting posited offsetting GHG forcing) being either similar to early 1900s or the early 1800s Dalton Minimum. 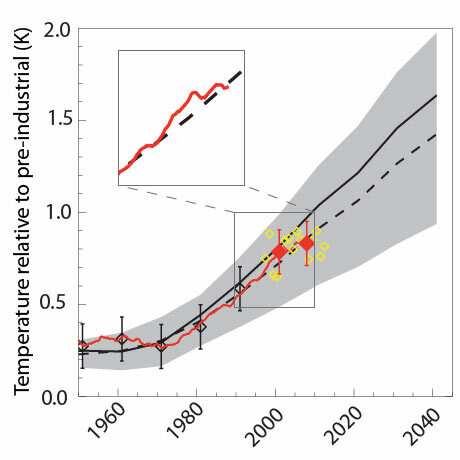 The Steinhilber and Beer (2013) implication in terms of climate regime by 2050 – 2100 (neglecting posited offsetting GHG forcing) being either similar to early 1900s or the early 1800s Dalton Minimum. This prediction is similar to the De Jager and Duhau (2012) paper. April 16th, 2013 by Roy W. Spencer, Ph. D.
If I am correct (explanation #1), then we will continue to see little warming into the future. Additional evidence for lower climate sensitivity in the above plot is the observed response to the 1991 Pinatubo eruption: the temporary temperature dip in 1992-93, and subsequent recovery, is weaker in the observations than in the models. This is exactly what would be predicted with lower climate sensitivity. On the other hand, if Trenberth is correct (explanation #2), then there should be a period of rapid surface warming that resumes at some point, since the climate system must eventually try to achieve radiative energy equilibrium. Of course, exactly when that might be is unknown. Explanation #3 (anthropogenic aerosol cooling), while theoretically possible, has always seemed like cheating to me since the magnitude of aerosol cooling is so uncertain it can be invoked in any amount desired to explain the observations. Besides, blaming a lack of warming on humans just seems a little bizarre. The dark line in the above plot is the 44-model average, and it approximately represents what the IPCC uses for its official best estimate of projected warming. Obviously, there is a substantial disconnect between the models and observations for this statistic. I find it disingenuous for those who claim that, because not ALL of individual the models disagree with the observations, the models are somehow vindicated. What those pundits fail to mention is that the few models which support weaker warming through 2012 are usually those with lower climate sensitivity. 4. The heat capacity of the ocean is over 1000 times greater than the atmosphere. Atmospheric temperature changes [and CO2] follow ocean temperature changes. The oceans control the atmospheric temperature, and the tail doesn’t wag the dog. Not sure what this “44 model” graph is of in terms of RCP because it doesn’t seem to reconcile with the earlier 38 and 34 model RCP4.5 graphs i.e. 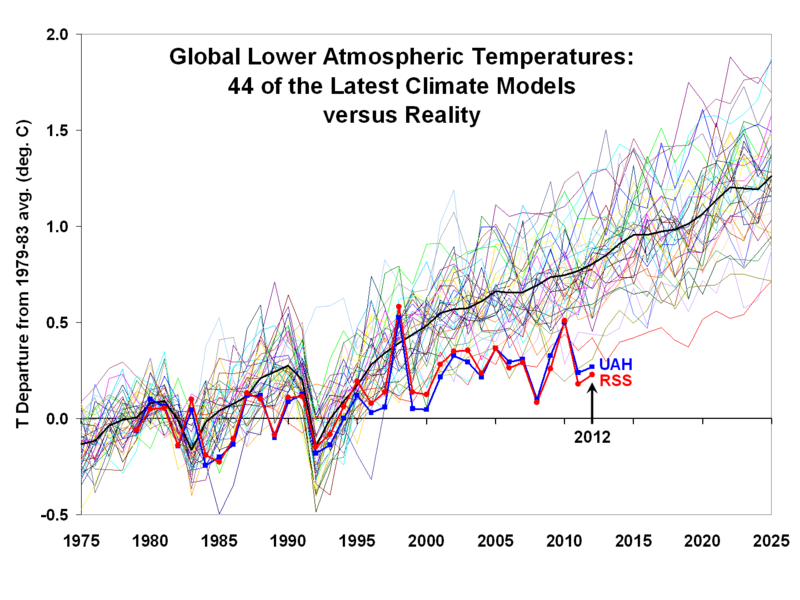 there are 2 models on the UAH/RSS trajectory at 2012 in the 38 model plot but none in the 44 model plot. The model forecasts certainly haven’t been fulfilled in the 44 model vs reality comparison. In the past 6 months or so, we have seen numerous different plots of the CMIP5 climate model simulations versus observations. The next time I encountered a similar diagram was in the leaked IPCC AR5 SOD, chapter 1, Figure 1.4. I am not going to reproduce that figure here since I am not sure about the legal status of this situation in context of my agreement with wordpress.com, but you can find the link [here]. In short, the diagram shows, for the period 1990-2015, the spread of FAR, SAR, TAR, AR4 and AR5 climate model simulations against the three main global surface temperature analyses. The also include a gray shading that corresponds to observational uncertainty and internal variability (although I have no idea how ‘internal variability’ is taken into account). the average over the first half of the twentieth century. impact on solar eruptive activity. temperatures remain below the average of the first half of the 20th century. RC, Your endless quoting of stale old denier memes from flawed papers by bogus researchers like Archibald and Idso has become boring and tiresome, which is why no-one reads your posts anymore. Analysis of the sun’s varying activity in the last two millennia indicates that contrary to the IPCC’s speculation about man-made global warming as high as 5.8� C within the next hundred years, a long period of cool climate with its coldest phase around 2030 is to be expected. It is shown that minima in the 80 to 90-year Gleissberg cycle of solar activity, coinciding with periods of cool climate on Earth, are consistently linked to an 83-year cycle in the change of the rotary force driving the sun’s oscillatory motion about the centre of mass of the solar system. As the future course of this cycle and its amplitudes can be computed, it can be seen that the Gleissberg minimum around 2030 and another one around 2200 will be of the Maunder minimum type accompanied by severe cooling on Earth. This forecast should prove skillful as other long-range forecasts of climate phenomena, based on cycles in the sun’s orbital motion, have turned out correct as for instance the prediction of the last three El Niños years before the respective event. These theoretical considerations have been corroborated by practical results. Predictions based on cycles in the sun’s motion turned out to be correct. My long-range forecasts of precisely defined classes of energetic X-ray flares and strong geomagnetic storms, covering the period 1979 � 1985, reached an overall hit rate of 90 percent though such events show a very irregular distribution. These forecasts were checked by the Space Environment Center, Boulder, and the astronomers Gleissberg, Wöhl and Pfleiderer (Landscheidt, 1986; Landscheidt and Wöhl, 1986). Accumulations of strong geomagnetic storms around 1982 and 1990 were also correctly forecast several years before the events. I predicted, too, in 1984 (Landscheidt, 1986, 1987) that the sun’s activity would diminish past 1990. Just this happened. Though a panel of experts (Joselyn, 1997) had predicted in 1996 and even two years later that sunspot cycle 23 would have a large amplitude similar to the preceding cycles (highest smoothed monthly sunspot number R = 160), the observed activity was much weaker (R = 120). My climate forecasts based on solar motion cycles stood the test as well. I correctly forecast the end of the Sahelian drought three years before the event, the last four extrema in global temperature anomalies, the maximum in the Palmer drought index for U.S.A. around 1999, extreme river Po discharges around the beginning of 2001, and the last three El Niños as well as the course of the last La Niña (Landscheidt, 1983-2002). This forecast skill, solely based on cycles of solar activity, is irreconcilable with the IPCC’s allegation that it is unlikely that natural forcing can explain the warming in the latter half of the 20th century. Fig. 11 shows that solar activity of outstanding intensity and corresponding warm periods on Earth, too, are indicated by the extrema of dT/dt. As an example, the Medieval Optimum is marked by an arrow. It should be noted that the outstanding positive amplitude around 1120 is greater than the amplitudes around 1952 and 1984 indicating the modern Gleissberg maxima linked to warming not as high as around 1120 (Schönwiese, 1979). More details of this relationship will be presented elsewhere. Without exception, the outstanding negative extrema coincide with periods of exceptionally weak solar activity and vice versa. 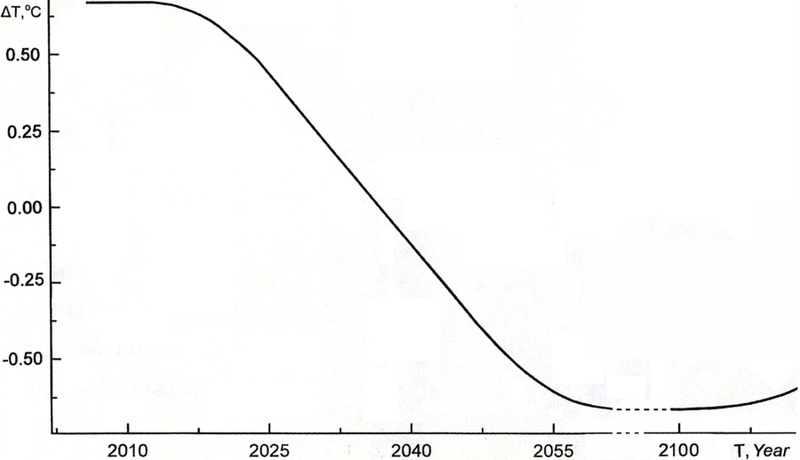 So there are good reasons to expect that the coming Gleissberg minimum around 2030 will be a deep one. As there are three consecutive extrema below the quantitative threshold, there is a high probability that the event will be of the Maunder minimum type. This is also true as to the minimum around 2201, whereas the minimum around 2122 should be of the regular type, as can be seen in Fig. 11. It has been shown that there is a close relationship between deep Gleissberg minima and cold climate. So the probability is high that the outstanding Gleissberg minima around 2030 and 2201 will go along with periods of cold climate comparable to the nadir of the Little Ice Age. As to the minimum around 2030, there are additional indications that global cooling is to be expected instead of global warming. The Pacific Decadal Oscillation (PDO) will show negative values up to at least 2016 (Landscheidt, 2001), and La Niñas will be more frequent and stronger than El Niños through 2018 (Landscheidt, 2000). We need not wait until 2030 to see whether the forecast of the next deep Gleissberg minimum is correct. A declining trend in solar activity and global temperature should become manifest long before the deepest point in the development. The current 11-year sunspot cycle 23 with its considerably weaker activity seems to be a first indication of the new trend, especially as it was predicted on the basis of solar motion cycles two decades ago. As to temperature, only El Niño periods should interrupt the downward trend, but even El Niños should become less frequent and strong. The outcome of this further long-range climate forecast solely based on solar activity may be considered to be a touchstone of the IPCC’s hypothesis of man-made global warming. The IPCC’s forecasts to 2100 on the other hand, being on the cusp of invalidation in 2013. Links to links that link back to themselves. Richard C is correct, the climate is cyclical. Hullo, the cyclicity denier has turned up too. Better late (and irrelevant) than never. 182. Whether the global temperature standstill of the past 15-16 years continues, or is replaced by warming, as the IPCC predicts, only future data will tell. Meanwhile, the length of the standstill implies that the challenge it offers for models of future climate prediction, and explanations for past warming, cannot be ignored. We are on the cusp of climate model vulnerability. And the pile of literature detailing centennial scale climate cycles up-thread and accessible by Google Scholar and the ‘Web of Science’ database is by numerous scientists who “see patterns where none exist”, according to Simon the cyclicity denier’s proclamation. This individual must be someone that knows a lot more than literally hundreds of scientists and multitudes of laymen and should be taken at his word. I see our old friend AndyS offering his “pearls of wisdom” in the comments on the Southland Times – of course continuing to perpetuate the falsehood that Jim Hansen and others have “admitted” no warming over the past decade. The truth of the matter has been explained to him not only here but elsewhere, but yet he persists with his utter tosh. As sad a fellow as Ring…. Fortunately people are beginning to see him for what he is… a deluded fanatic. Unfortunately, for our deluded eco-fachist Macro, projection is the name of the game. Hansen quite clearly referred to the pause or hiatus in warming in his recent paper on temperatures. These semi-literate cretins at Hot Topic and elsewhere seem to think they can continue lying and making stuff up to support their apocalyptic death cult. Right, Andy, the existence of mythical “oceans” that somehow “absorb heat” is just a figment of the fevered imaginations of warmist apocalyptic death cult nutters. Thank Heavens for calm and rational observers such as yourself, who can see through such desperate nonsense. A grateful world will surely, one day, give you the recognition you deserve. I was referring to the “surface temperature record”. You know, the one that HADCrut3/4 etc refer to. The “pause” in these series is well documented, as you and everyone else knows. When I refer to the “AGW death cult”, I am specifically referring to the guys who comment at Hot Topic; in this case taking my name in vain. I don’t think there’s much contention that the oceans absorb solar radiation that is converted to heat in the process but perhaps you could enlighten us RRO as to the anthropogenic-based mechanism by which atmospheric heat is absorbed by the ocean? BTW RRO, my first question re your process is that you will be tracking the (unconventional but not impossible) flow of heat from air to sea but that heat originated in the sea as a result of solar heating and left the ocean unrestricted. Why is it restricted from leaving and accumulating the second time round as a result of the anthropogenic mechanism? That was an impolite thing to say among “civil society” Andy. Ah, clue at Andy’s BH article link down-thread. The earlier 34 and 38 model vs reality comparison must be near surface. The latest Christy/Spencer 44 model vs reality comparison must be for higher up in the troposphere, the graph title is “Lower Atmosphere” which I take to mean lower troposphere but above near surface. It would have been helpful to have the respective altitudes specified for each graph. RC, why don’t you publish your novel theories in a scientific journal, where they can garner the respect they deserve? Last week hard-hitting Swiss weekly Weltwoche published a revealing interview with IPCC WG-1 Co-Chair Thomas Stocker. The interview was conducted by Markus Schär. What follows is the interview along with Lüning’s rebuttals in English. Because of the interview’s length, it will appear in 3 or 4 parts over the next few days. Some parts have been slightly shortened and edited. The Stocker interview not only exposes misleading science, but also provides good hints as to how the IPCC intends to approach its 5th report. WELTWOCHE: IPCC Chairman Rajendra Pachauri recently admitted that there has not been any global warming for 17 years. STOCKER: I can’t tell other colleagues what to say. STOCKER: My function together with the international team of authors is to summarize the science; that’s what we are doing right now. From the studies we are addressing the following: a) is such a stagnation usual, b) are we going to see such phases also in the future, and c) this is the most important point, there are in the meantime over 100 simulations of climate development using the latest models. The question is: Do we see simulations that show no warming between 1998 and 2012? We do find such simulations, not many, but one or two. We are simply living in a realisation of a climate system with its chaos of natural variability – in the single one observed of many possible physical ones. Lüning: Here Stocker is spreading the full superbness of the IPCC. Using lots of impressive words, he’s trying to come up with reasons for the warming stop, but is sadly unable to come up with anything convincing. As expected, Stocker pulls out the old chaos models from his hat. He’s hoping that of the hundreds of simulations carried out, a few will be able to show a warming stop over the last 15 years. This would then be the proof that the models are “extremely good”. Is Stocker really so naive to think that this would actually serve as proof? This would be like someone picking all 49 numbers of a lottery and then later claiming he picked the 6 correct numbers! Thanks for the reference, RC. I was just reaching for my email pen. Rob (“RRO”), how does the warmth get through the top layer without detection? I missed that part. In Warmer World maybe but the real world is a little different. Balmaseda, Trenberth, and Källén (2013) end their analysis at 2009 (why?) and only look at the global aggregate (why?). 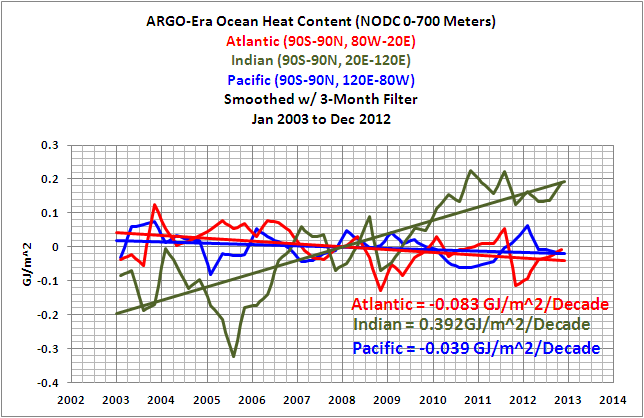 If they had carried out a basin-by-basin analysis to end of 2012 that anyone with an internet connection can do they would have discovered that the upper Pacific and Atlantic have been cooling (Pacific) or flat (Atlantic) in the ARGO era and the Indian has recently stabilized (now flat for the last 4 yrs or so). I’ve already gone round and round with JoNova’s resident troll Nice One on this and have ready access to more than a couple of SkS posts can answer so if you want to go on with this you better have the goods RRO. Neither of those two papers document an anthropogenic ocean heating mechanism or advance the IPCC’s 25 year quest to find one. BTW, no clues as to an anthro ocean heating mechanism you can elucidate in your own wards RRO? No statistically significant warming for between 16-23 yrs. They can’t argue with a website they claim is trustworthy, and the data sources are: GISTEMP, NOAA, HADCRUT, RSS, UAH, BEST. Just to rub salt into the wound the equations are from Foster and Rahmstorf, 2011 – hehe. It’ll drive them into a frenzy. I’d do it myself but I just can’t be bothered signing up to stuff.co.nz & wasting my time with those ignoramuses anymore. The argument from the standstill deniers is that we are just looking at “noise” in the raw data and that “exogenous” factors (e.g. ENSO) should be “taken out” (Foster and Rahmstorf 2011). But when the data is smoothed over 10 years the standstill is evident albeit lagged 8 years in the smoothed series. Sure the fall in the 10 yr smoothed series is minute but Jones, Lockwood and Stott (2012) (AR5 SOD Chap 10: Radiative forcing, linked up-thread) say the solar recession will only mitigate 0.1 – 0.6 K of warming over the 21st century but already since the beginning of 2011 a little over 0.0075 K has been whittled away from the 10 yr smoothed warming peak at end of 2010 – let alone non-existent continued warming 2011 – 2013. Given that the effects of lower solar output are not expected to become readily apparent until at least 2014, Jones, Lockwood and Stott (and the IPCC vicariously) have a problem. You misrepresent what I wrote RC, which is your standard tactic for spreading confusion and doubt. I didn’t say that there are no cycles in nature; tides and Milankovitch cycles are real and reasonably predictable through calculus. However, anything that is an output from a chaotic system may follow patterns but the “cycles” are irregular, the Schwabe sunspot cycle can vary between 9 and 12 years. My comment about people seeing patterns where none exist was mostly directed at the Ken Rings of the world but trying to link climate solely to solar cycles qualifies as well. I’m glad he’s cleared that up,……I was beginning to think he was exaggerating a bit there. So you’re still denying the papers up-thread that do exactly that? In case you haven’t noticed Simon, there’s considerable debate going on over the GMST “standstill” (actually now a falling trend this century). That standstill is inconsistent with rising GHG levels but entirely consistent with falling solar output. There is now no driver to push temperatures higher than their peak earlier this century, CO2 is evidently ineffective and so is solar now. So the expected climate regime over the next 30 yrs will be that of lower solar output, the first level of which will correspond to early 1900s conditions but much sooner down than the 100 yrs lead up (see the IPCC’s own Mike Lockwood up-thread for that). Although you wouldn’t conclude a significant trend from two years’ of data, right? Not even just a trend from 2 yrs raw data but the inflexion in the 10 yr SMA is certainly significant in terms of trajectory. What caused the radical change in the underlying trajectory if we are not looking at noise? And what factor(s) is(are) driving the new underlying trajectory – a significant and negative departure from positive (even from y = 0) pre-2011? Certainly not aCO2. I would add too that the 10 yr SMA GMST is in almost perfect sync with the OHC global aggregates down to 700m and to 2000m so both atmosphere and ocean have peaked when noise is eliminated from atmosphere. the inflexion in the 10 yr SMA is certainly significant in terms of trajectory. I don’t understand what makes an average of insignificant data significant. What caused the radical change in the underlying trajectory if we are not looking at noise? If by change you mean flattening out after a rise, what makes it radical? The cause of the recent two-year dip hardly matters if we agree it’s not even a trend, but it’s probably natural variation “noise”). GISTEMP from 1996 (17 yrs): Trend: 0.111 ±0.122 °C/decade (2σ) – statistically insignificant warming. GISTEMP from 2000 (13 yrs): Trend: 0.069 ±0.171 °C/decade (2σ) – statistically insignificant warming/flat. Each monthly datapoint on Paul Homewoood’s 10 yr SMA carries the average of the previous 10 yrs of data with it and so on to the next datapoint so each monthly datapoint contains 10 yrs of significance – not just the instantaneous level at that month. The effect of any “noise” is no longer an issue (e.g. an El Nino or La Nina effect is averaged out over 10 yrs as it should be – not “taken out” as Foster & Rahmstorf suggest). The fact that is so apparent in the 10 yr SMA and the significance of each monthly 10 yr SMA datapoint as above. Again, think of the cause if ENSO has been eliminated from contention. Again, it’s not a “two-year dip” (it’s a 10 yr dip) neither is it “noise” (10 yr SMA eliminates noise) – this matters a lot. The new trajectory (from the 2010/11 inflexion/peak) has been established on the basis of 10 yr smoothing. The effect of the 2008 La Nina and 2010 El Nino would be eliminated and the lower levels of 2011 and 2012 (relative to early 2000s) would be evident as a downward inflexion. Rising continually except for small downturns when strong La Ninas pulled down the average after strong El Ninos pushed it up. But the latest 2 yr+ downturn has no such strong preceding El Nino-to-La Nina transition that occurred 1998-99 or 2007-8 for example i.e. there is some other driver operating in the 2010/11 inflexion and the forcing direction of that driver that was pushing the lagged SMA (lagged about 8 yrs from raw) up since 1990 and before that has now reversed. In solar terms, the 10 yr SMA lag must be added to the thermal lag of planetary inertia evident in unsmoothed data i.e. a range of 10 + 8 yrs = 18 yrs to 10 + 20 yrs = 30 yrs (using Abdussamatovs inertia calcs). This total lag starts 1986 or thereabouts when solar output reached Grand Maximum giving 1986 + 18 = 2004 and 1986 + 30 = 2016. Therefore a 10 yr SMA solar-driven inflexion at 2010/11 (if that is what it is) falls exactly in the middle of the range 2004 to 2016 when all the lags are accounted for. As I keep saying, the next 1 or 2 yrs are the acid test not just for the IPCC’s GHG-centric solar scenario but for the non-IPCC, non-GHG solar-centric scenario too. Both will be tested conclusively depending on what plays out. If the 10 yr SMA in HadCRUt4 continues on its current trajectory the latter scenario is the winner barring ENSO events because not only will the models be falsified by the modelers own criteria (uncertainty bounds and time without warming) but Jones, Lockwood and Stott’s GHG-centric solar modeling (only 0.06 – 0.1 K solar mitigation of warming) will be rapidly disproved too. The 2010 El Nino was strong but the following La Nina wasn’t. On reflection a 10 yr SMA eliminates not just ENSO events but also about one 3rd (about 10 yrs) of the current 30 yr negative phase of the 60 yr climate cycle (what Simon denies). Given that then, rather than a solar-driven inflexion at 2010/11, what we are actually seeing in the 10 yr SMA is the 10 yr lagged equivalent of the early 2000s inflexion in the raw data that began the now decade(+) long standstill. There is actually a falling trend in raw SST and GMST since the early 2000s but not statistically significant. That trend is comparable to the current SMA trajectory. From what I can gather, solar-recession-driven climate effects of any measurable significance are not expected to show up in the GMST until 2014 and later i.e. after the current SC 24 peak even though it is abnormally weak. Or maybe late this year depending on what happens with the SC 24 peak. Gosh, RT, might it just possibly have something to do with the physics and chemistry of the oceans? Of course, education can free the mind, so be very, very careful what you let in, lest it make a “warmist” of you. The warmth goes down from sfc to below 700m by “upwelling”? Hmmm…..
And without detection in the 700m layer either – that’s smart water RRO. In your own words, please, Rob, not the slick links. This is a conversation, not a year book. And leave out the gratuitous insults or you’ll be banned again, mate. So rather than just pointing to “thermohaline circulation, upwelling and gyres” a more complete explanation is that the solar driver is no longer of sufficient strength to maintain Pacific and Atlantic 0-700m OHC (both cooling) once circulation currents have moved warm water from the upper layers of both (mainly the Pacific going by the currents) to the Indian Ocean and to below 700m (mainly the Atlantic going by the source data). But note the upper Indian ocean has stabilized since 4Q2010 so that the aggregate of all 3 basins has been flat since then. And if the upper layer of the largest ocean basin (Pacific) has been cooling since 2003 there’s certainly no anthropogenic or solar ocean heat forcing going on. A paper published today in Atmospheric Chemistry & Physics reviews recent satellite data finding that variations in solar UV within solar cycles are up to 6 times greater than previously believed, and that these variations have a significant influence upon the atmosphere and regional climate change. The authors also find that current models don’t reproduce these observations. The IPCC dismisses the role of the Sun in climate change by only considering small changes in total solar irradiance [TSI], while ignoring amplification mechanisms such as the large changes in solar UV within and between solar cycles. Makes a refreshing change from Retired Financier or whatever. Nice to see Dr Curry giving credit where it is due. In that case, Richard, as you are clearly unwilling – or unable – to learn anything new about the nominal topic of your own blog, I will leave you to enjoy the turgid effluvia of such rebarbative luminaries as RC and Andy. I was fortunate the other night to attend a presentation by Christopher Monckton as part of his Climate of Freedom Tour of New Zealand. But in your case RRO, reading a review of a CC alarm film (5 yrs in the making i.e. already out of date) and vague allusion to natural ocean phenomena references is “learning”? There’s plenty of investigation in this thread to keep anyone probing AGW issues busy for some time if they are of a mind to. Or they could, as Simon does of course, deny any possibility that there are perfectly natural explanations for the current state of the global climate and that aGHG forcing may not offset the climatic change evident as a result of natural cycles after all contrary to what the IPCC would have everyone believe. The IPCC climate scientists being those that are “puzzled” by the current standstill – not those deferring to historical evidence of the cyclical nature of climate. WELTWOCHE: So you would never say that we are observing 17 years of climate warming stagnation? STOCKER: No, already the association of ‘seventeen years’ and ‘climate warming’ is false. When we talk about a climate warming we mean the long-term trend, the one we see in the second half of the 20th century. Lüning: That’s a bit mysterious. In a paper appearing in 2011, Stocker’s former IPCC colleague Ben Santer and 16 other co-authors determined that 17 years are enough to detect a climate trend. Now it has been 17 years since the end of warming began and suddenly many more years are required. What doesn’t fit is made to fit. Real science looks completely different. WELTWOCHE: Then we’ll have to wait until 2035 to check to see if you’re right? STOCKER: No. As I’ve said, we have been assessing climate projections at the IPCC since 1990 and they have been measurably right up to today. If you ask me, if I’m still in good health in 2035, I’ll be looking back at a short phase of temperature stagnation that resulted from a combination of various effects – that is if a large volcano doesn’t erupt. Lüning: Professor Stocker, we’ve already been through all that. Die IPCC temperature prognoses since 1990 have not been “measurably right“, rather they have been poor to outright useless. Is this perhaps the IPCC’s last thread that is keeping it from going under? Is this what modern, robust science looks like? To be more specific, ocean cycles specialist Professor Mojib Latif warned not long ago that a warming cannot be expected over the next decade due to cooling Atlantic and Pacific cycles. This is completely plausible and is in agreement with the empirical findings of the last century. Thus it is only a question of a few years before the real temperatures drift below the lower boundaries of the IPCC simulated temperature range, which once was considered an impossibility. When that happens, the last thread breaks and it all goes down. The 54-year old Stocker will likely experience this inconvenience long before he reaches retirement. It remains open whether or not he will have the courage to openly discuss the errors of the IPCC simulations. But why wait until then? Already today it would be high time to take a hard look at reality and to start taking the natural factors of climate change into account. WELTWOCHE: Couldn’t we better explain the climate cycles with the sun’s influence? STOCKER: That’s valid for pre-industrial times when CO2 was more or less 30% below today’s levels. We still need the sun as part of the explanation – here we have no differences. But for the last 50 to 70 years, and especially concerning the extent of the warming, it is not possible to conclusively explain it without the man-made factors. Why did the temperature increase 0.8°C during the 20th century? This cannot be explained without CO2. Lüning: Precisely. Why did the temperature increase 0.8°C during the 20th century? Is CO2 really needed? If so, then how much? Have we seen such temperature increases in the past? Stocker here remains silent as the scientific facts on this point are inconvenient and clear. Over the last 10,000 there have been such warming phases on multiple occasions occurring in 1000 year cycles. And yet another surprise: The main drive behind these changes was solar activity fluctuation, as is impressively confirmed by numerous studies. As one may suspect, the second half of the 20th century was one of the most solar-active over the last 10,000 years. What a huge coincidence! Unfortunately, the IPCC has elected to ignore this massive body of science. This is yet another huge defect in the IPCC house in addition to the PDO lapse. STOCKER: This is precisely why we specify uncertainties. But we also have to look back: Were there earlier periods where the global mean temperature stagnated over 10 or 15 years? Indeed we find several such windows in the last 100 years. So it’s nothing really unusual. Lüning: Of course there have been cold phases in the past. And we noticed that the cold was always in sync with the cold Pacific and Atlantic Ocean cycles. The IPCC just doesn’t want to acknowledge this relationship and stubbornly claims the cold would never follow any system and would just disappear. This is the only way that the IPCC could so grandly fail with the temperature development of the last one and a half decades. At about 2000 the PDO began its downward phase. So it was clear from the start that we should expect cooling for the coming decades. If the IPCC had accepted this empirical forecasting tool earlier, it would have one less problem to deal with today. However, there’s a good reason why the IPCC refused to acknowledge the PDO’s obvious impact on the global temperature development: During the main warming phase of 1977-2000 the PDO climbed and remained at a warm plateau, taking the global temperature up a few tenths of a degree with it. These were a few tenths of a degree that the IPCC had already chalked up to CO2. Nic Lewis has written a paper on the subject of the Earth’s climate sensitivity (how much surface temperatures will warm in response to the increased greenhouse effect from a doubling of atmospheric CO2, including amplifying and dampening feedbacks) which has been accepted by the Journal of Climate. First of all, we would like to offer kudos to Lewis for subjecting his analysis to the peer review process, which is something few climate contrarians are willing to do. The paper is an outlier, finding a lower climate sensitivity than most other studies, and outside the likely range cited in the Intergovernmental Panel on Climate Change (IPCC) report. It’s most important not to fall into the trap of thinking that any single study will overturn a vast body of scientific evidence, derived from many different sources of data (or as Andrew Revkin calls this, single-study syndrome). This was also recently an issue with regards to a similar and unpublished Norwegian study. Lewis’ is just one paper using one of many possible methods to estimate climate sensitivity. The overall body of evidence indicates that the Earth’s surface temperatures will warm 2–4.5°C in response to a doubling of atmospheric CO2. An outlier among an increasing number of outliers; the “overall body of evidence” and “a vast body of scientific evidence” looking more and more doubtful each year passing. But I suppose that article had to be written at SkS. Vahrenholt and Lüning believe that the rapid warming up through the year 2000 and was due to several coincident factors, most importantly having to do with sun cycles. It has long been known that solar radiation varies over time in a predictable fashion. There are solar cycles of 11, 22, 87, 210, 1000 and 2300 year durations. When they overlap, it can result in appreciable variation. That’s 3 major overlapping cycles – 87, 210, 1000. Make that 4 major overlapping cycles – 60, 87, 210, 1000. Weltwoche: Don’t you feel a little queasy when astrophysicists say the sun is currently weakening as much as it did during the Little Ice Age of the 17th century? STOCKER: No, today it is impossible to forecast solar activity because unfortunately we are missing precise data and models. But we cannot exclude that such a phase may have already begun. However, it’ll eventually end – and in the meantime the CO2 concentration continues to rise and this will lead to even greater warming. Lüning: Oh dear, this is not good, Professor Stocker. Today we can almost say there’s a consensus among astrophysicists that the sun will be very inactive over the coming decades. A Swiss paper on this topic by Steinhilber and Beer (see the last paragraph of our blog article”Wer ist Schuld am Kältewinter? MPI-Studie weist eher auf die schwache Sonne anstatt des arktischen Meereises hin. Die Sonne im März 2013“) appeared recently. Currently there is hardly a single paper out there that contradicts this. It’s no use playing dumb on this point and, as is the case with the pauses in warming, to act like nothing is really known and that everything is just chaos. The reconstructions of solar activity of the past thousands of years are very regular in nature and the pattern cannot be ignored. What’s even worse is that Stocker mixes-up the solar internal cycles with the Milankovitch cycles. The two have nothing to do with each other. The solar internal cycles involve changes in the intensity of the sun’s hydrogen reactors. Stocker’s reference to CO2 changes in sync with the Milankovitch cycles that are 20,000 years and more completely misses the barn. Could it be that Stocker is not familiar with the subject and is thus incapable of keeping the mechanisms apart? Or is it just another attempt to mislead the reader? No water vapour = no AGW. The AGW hypothesis is a dud without it. Currently there is hardly a single paper out there that contradicts this. It’s no use playing dumb on this point and, as is the case with the pauses in warming, to act like nothing is really known and that everything is just chaos. The reconstructions of solar activity of the past thousands of years are very regular in nature and the pattern cannot be ignored. What’s even worse is that Stocker mixes-up the solar internal cycles with the Milankovitch cycles. This confuses me. Where does Lüning’s quote end and your comments begin? Please clarify. None of that is my commentary RT. It is a Weltwoche – Stocker interview with Lüning comments. Also symptomatic of increasing scepticism in German main-stream media IMO. Oh, ok. So where does the Lüning quote end and someone’s comment begin? For at the beginning Lüning seems to be addressing Stocker directly. Lüning was not present at the Weltwoche – STOCKER interview, he is commenting on Stocker’s answers retrospectively. Thanks Richard. That’s clear now. 4. global land plus sea surface temperatures when the data is divided into multidecadal warming and cooling periods. In this post, we’ll compare the multi-model ensemble mean of the CMIP5-archived models, which were prepared for the IPCC’s upcoming AR5, and the new GISS Land-Ocean Temperature Index (LOTI) data. As you’ll recall, GISS recently switched sea surface temperature datasets for their LOTI product. The observed warming rate during the early warming period is comparable to the trend during the recent warming period. See Figure 11. But according to the models, Figure 12, if global temperatures were warmed by greenhouse gases, global surface temperatures during the recent warming period should have warmed at a rate that’s more than 4 times faster than the early warming period—or, more realistically, the early warming period should have warmed at a rate that’s 22% of the rate of the late warming period—yet the observed warming rates are comparable. That’s one of the inconsistencies with the hypothesis that anthropogenic forcings are the dominant cause of the warming of global surface temperatures over the 20th Century. The failure of the models to hindcast the early rise in global surface temperatures illustrates that global surface temperatures are capable of warming without the natural and anthropogenic forcings used as inputs to the climate models. Another way to look at it: the data also indicate that the much higher anthropogenic forcings during the latter later warming period compared to the early warming period had little to no impact on the rate at which observed temperatures warmed. In other words, the climate models do not support the hypothesis of anthropogenic forcing-driven global warming; they contradict it. A new post at ClimateMonitor.it by Carlo Tosti demonstrates that the global temperature record since 1880 is highly correlated to solar activity, and that solar activity is in turn highly correlated to the harmonics of planetary motion. These correlations and accumulating evidence of an amplified solar effect on Earth’s climate would tend to suggest a “unified theory” of climate change, whereby gravitational effects from planetary motions cause small changes in solar activity, which are then amplified via cosmic rays/clouds [Svensmark’s theory of cosmoclimatology], ozone, and ocean oscillations to cause large changes in Earth’s climate. A paper published today in Theoretical and Applied Climatology finds the 11-year solar cycle is correlated to the quasi-biennial oscillation (QBO), a wind reversal that “dominates” variability of the lower stratosphere and in turn “affects a variety of extratropical phenomena including the strength and stability of the winter polar vortex.” The IPCC AR4 states that the IPCC climate models do not include the quasi-biennial oscillation due to inadequate understanding of the causes, and “Due to the computational cost associated with the requirement of a well-resolved stratosphere.” The paper adds to many others finding solar amplification mechanisms that are not included in the climate models the IPCC uses to dismiss the role of the Sun. 23 January 2012 – New research has found that solar output is likely to reduce over the next 90 years but that will not substantially delay expected increases in global temperatures caused by greenhouse gases. Carried out by the Met Office and the University of Reading, the study establishes the most likely changes in the Sun’s activity and looks at how this could affect near-surface temperatures on Earth. It found that the most likely outcome was that the Sun’s output would decrease up to 2100, but this would only cause a reduction in global temperatures of 0.08 °C. This compares to an expected warming of about 2.5 °C over the same period due to greenhouse gases (according to the IPCC’s B2 scenario for greenhouse gas emissions that does not involve efforts to mitigate emissions). Professor Lockwood said: “The 11-year solar cycle of waxing and waning sunspot numbers is perhaps the best known way the Sun changes, but longer term changes in its brightness are more important for possible influences on climate. 3) The UKMO/UofReading/IPCC climate scenario – in the face of the 21st century standstill in global warming – is “expected” warming of about “2.5 °C by 2100”. 4) The UKMO/UofReading/IPCC climate scenario alternative (1820 Dalton Minimum repeat) to their “most likely outcome” (only 0.08 °C reduction of 2.5 °C warming by 2100) is “unlikely” but the inference of the uncertainty is that the alternative is not out of the question i.e. beyond consideration; unthinkable or impossible. Science vs. Sensationalism: Is the Earth absorbing the energy from 400,000 Hiroshima bombs every day, as Hansen claims? […] The Earth surface is about 197 million square miles in size. Dividing that area by 400,000 Hiroshima blasts works out to about 493 square-miles per bomb blast. So Hansen’s claim is that every New York City-sized surface area (land and water) is absorbing a Hiroshima blast’s worth of energy every day. Its worse than you thought. Hansen blathers about the modeled energy imbalance of a Watt per square meter. He of course neglects the all important context that the top of atmosphere receives an average of about 340 W/m^2 from the sun. That is the ‘equivalent’ of 136,000,000 Hiroshima bombs every day! The Hiroshima analogy works because the press and politicians are science illiterates. So here we are, viewers, deep in Treadgold Swamp, listening to the plaintive cry of the male Right-winged Loon searching for a mate. Jones, G. S., M. Lockwood, and P. A. Stott (2012), What influence will future solar activity changes over the 21st century have on projected global near-surface temperature changes?, J. Geophys. Res., 117, D05103,doi:10.1029/2011JD017013. Note 1: Uses HadCM3 (EBM configuration) that UKMO superseded with HadGEM3 for its decadal forecast revision at the end of 2012. Note 2: Like all Models vs Reality comparisons, their EBM simulations were already well above observations at end of obs series, 2010 El Nino year (Figures 5 and 6, pages 8 and 10). Extending obs to 2013 would look even worse. L00 TSI is Jones et al’s largest of 3 – 0.98 (L09), 1.26 (L07) and 2.55 W.m2 (L00), see Figure 1, page 3. The Shapiro et al., (2011) figure of 6 W m.2 is comparable to 5.75 W m.2 from Abdussamatov (2012). Shapiro, A. I., et al. (2011), A new approach to the long-term reconstruction of the solar irradiance leads to large historical solar forcing, Astron. Astrophys., in press. Context. The variable Sun is the most likely candidate for natural forcing of past climate change on time scales of 50 to 1000 years. Evidence for this understanding is that the terrestrial climate correlates positively with solar activity. During the past 10000 years, the Sun has experienced substantial variations in activity and there have been numerous attempts to reconstruct solar irradiance. While there is general agreement on how solar forcing varied during the last several hundred years—all reconstructions are proportional to the solar activity—there is scientific controversy on the magnitude of solar forcing. Aims. We present a reconstruction of the Total and Spectral Solar Irradiance covering 130 nm–10 μm from 1610 to the present with annual resolution and for the Holocene with 22-year resolution. Methods. We assume that the minimum state of the quiet Sun in time corresponds to the observed quietest area on the present Sun. Then we use available long-term proxies of the solar activity, which are 10Be isotope concentrations in ice cores and 22-year smoothed neutron monitor data, to interpolate between the present quiet Sun and the minimum state of the quiet Sun. This determines the longterm trend in the solar variability which is then superposed with the 11-year activity cycle calculated from the sunspot number. The time-dependent solar spectral irradiance from about 7000 BC to the present is then derived using a state-of-the-art radiation code. Results. We derive a total and spectral solar irradiance that was substantially lower during the Maunder minimum than observed today. The difference is remarkably larger than other estimations published in the recent literature. The magnitude of the solar UV variability, which indirectly affects climate is also found to exceed previous estimates. We discuss in details the assumptions which leaded us to this conclusion. Sounds like the squarks of a lesser spotted Taylor to me. unfortunately, not endangered. Poor Rob, he thinks insults are empirical evidence. CO2 from Mauna Loa (black) . If climate science acted like business………. Traditional forecasting techniques often fail to predict significant changes in the firm’s external environment, especially when the change is rapid and turbulent or when information is limited. Consequently, important opportunities and serious threats may be overlooked and the very survival of the firm may be at stake. Scenario planning is a tool specifically designed to deal with major, uncertain shifts in the firm’s environment. Scenario planning has its roots in military strategy studies. Herman Kahn was an early founder of scenario-based planning in his work related to the possible scenarios associated with thermonuclear war (“thinking the unthinkable”). Scenario planning was transformed into a business tool in the late 1960’s and early 1970’s, most notably by Pierre Wack who developed the scenario planning system used by Royal Dutch/Shell. As a result of these efforts, Shell was prepared to deal with the oil shock that occurred in late 1973 and greatly improved its competitive position in the industry during the oil crisis and the oil glut that followed. Scenario planning is not about predicting the future. Rather, it attempts to describe what is possible. The result of a scenario analysis is a group of distinct futures, all of which are plausible. The challenge then is how to deal with each of the possible scenarios. * Managers are forced to break out of their standard world view, exposing blind spots that might otherwise be overlooked in the generally accepted forecast. * Decision-makers are better able to recognize a scenario in its early stages, should it actually be the one that unfolds. An additional step might be to assign a probability to each scenario. Opinions differ on whether one should attempt to assign probabilities when there may be little basis for determining them. Business unit managers may not take scenarios seriously if they deviate too much from their preconceived view of the world. Many will prefer to rely on forecasts and their judgement, even if they realize that they may miss important changes in the firm’s environment. To overcome this reluctance to broaden their thinking, it is useful to create “phantom” scenarios that show the adverse results if the firm were to base its decisions on the mainstream view while the reality turned out to be one of the other scenarios. Using thermometer-based air temperature records for the period 1850–2010, we present empirical evidence for a direct relationship between total solar irradiance (TSI) and the Equator-to-Pole (Arctic) surface temperature gradient (EPTG). Modulation of the EPTG by TSI is also shown to exist, in variable ways, for each of the four seasons. Interpretation of the positive relationship between the TSI and EPTG indices suggests that solar-forced changes in the EPTG may represent a hemispheric-scale relaxation response of the system to a reduced Equator-to-Pole temperature gradient, which occurs in response to an increasing gradient of incoming solar insolation. Physical bases for the TSI-EPTG relationship are discussed with respect to their connections with large-scale climate dynamics, especially a critical relationship with the total meridional poleward energy transport. Overall, evidence suggests that a net increase in the TSI, or in the projected solar insolation gradient which reflects any net increase in solar radiation, has caused an increase in both oceanic and atmospheric heat transport to the Arctic in the warm period since the 1970s, resulting in a reduced temperature gradient between the Equator and the Arctic. We suggest that this new interpretative framework, which involves the extrinsic modulation of the total meridional energy flux beyond the implicit assumptions of the Bjerknes Compensation rule, may lead to a better understanding of how global and regional climate has varied through the Holocene and even the Quaternary (the most recent 2.6 million years of Earth’s history). Similarly, a reassessment is now required of the underlying mechanisms that may have governed the equable climate dynamics of the Eocene (35–55 million years ago) and late Cretaceous (65–100 million years ago), both of which were warm geological epochs. This newly discovered relationship between TSI and the EPTG represents the “missing link” that was implicit in the empirical relationship that Soon (2009) recently demonstrated to exist between multi-decadal TSI and Arctic and North Atlantic climatic change. 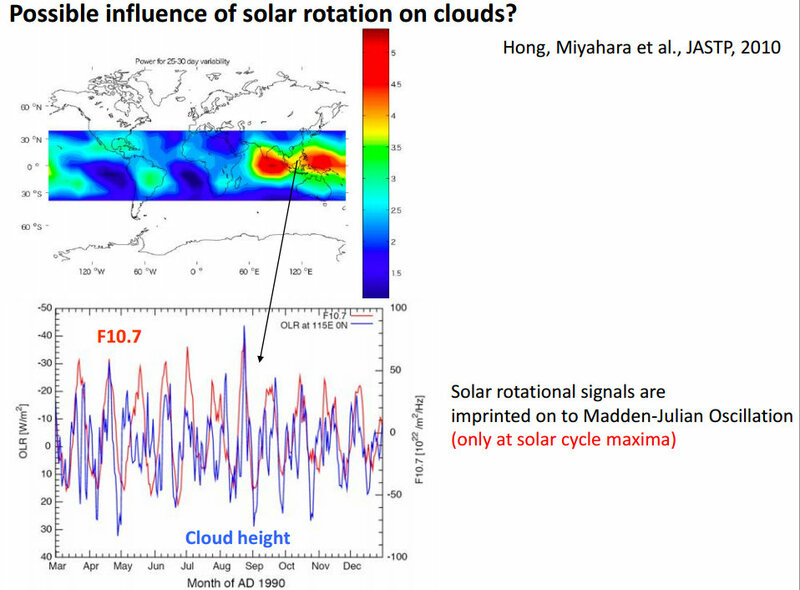 ► The Equator-to-Pole temperature gradient is linked to total solar irradiance. ► View presented of how poleward energy transport operates beyond the Bjerknes rule. ► Most convincing evidence for a Sun–climate connection during the Holocene. Fig. 1. Annual-mean EPTG over the entire Northern Hemisphere (°C/degree latitude; dotted blue line) and smoothed 10-year running mean (dashed blue line) versus the estimated total solar irradiance TSI (W m−2; solid red line) of Hoyt and Schatten (1993; with updates by N. Scafetta) from 1850 to 2010. We emphasize the relationship especially on multi-decadal timescales and report the TSI correlations only with the smoothed EPTG series with 10-year running means (since 1880) in Table 1. Increased TSI is related to decreased temperature gradients between the Equator and the Arctic (i.e., more positive EPTG values) and vice versa. No mention of GHGs so probably wont see the light of day in AR5. That and the fact that Soon and Legates are “deniers” in the pay of big evil oil, apparently. Consider the charts that accompany this article. In locations as widely separated as US, the Arctic and China, they show a strong and direct relationship between temperature and incoming solar radiation — the data for the US coming directly from Professor Muller’s own BEST data! That such a tight relationship between temperature and solar radiation holds for many disparate geographical areas indicates that the US result cannot be dismissed as just a local aberration. The hallmark of good science is the testing of plausible hypotheses that are then supported or rejected by evidence gathered from either observation or experiment. The evidence from BEST’s newly analysed data, and from our own and other published studies, is strongly consistent with the hypothesis that solar factors are the major cause of multidecadal climate change, especially in the northern hemisphere circum-Arctic regions. Incidentally, but importantly, BEST’s own data also clearly invalidate the alternative hypothesis that CO2 is the most important cause of observed temperature changes across the USA.